Cranberry juice can be helpful as a preventative for the bladder, but if you have an immediate need, only BLADDEREX contains a proven synergistic herbal combination that starts to work immediately. Most men and women feel results within hours. Promote a healthy Bladder - naturally...with Bladderex! Ingredients: Proprietary blend of Coin-Leaved Desmodium (leaves), Corn (silk), Abrus (root), Herba Pyrosiee (leaves), Smilax Glabra (root). I took 2 tablets three times a day ... I feel normal again. I highly recommend this product ... it s truly a miracle. I used your product Bladderex when I started having problems ... and I no longer had the problem thanks to Bladderex and Earth s Bounty. 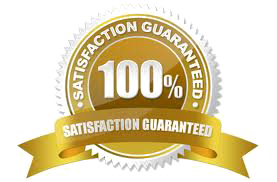 I highly recommend Bladderex to all my customers with supreme confidence that it will work. Thank you Earth s Bounty for creating such a solution driven product. Is BLADDEREX better for bladder issues than cranberry juice or supplements? Yes. Cranberry juice and extracts can be helpful, but their effectiveness is mainly in prevention. Once you have an immediate need, we guarantee you will prefer the synergistic herbal formula in BLADDEREX for its faster-acting and more effective results. When should you use BLADDEREX? At the first sign that you need a bladder supplement, take two tablets three times daily. Most people only need it for about 3 days. Sometimes, when I cough, my bladder leaks a little. Will this help? It may. 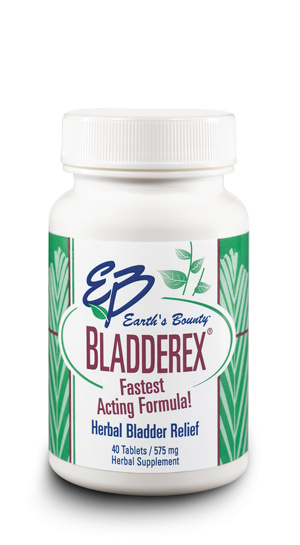 BLADDEREX has worked with leaky bladders for both women and men. Why is the formula all herbal? Herbs are Mother Nature s most natural and potent helpers. They can help nourish and tone the bladder gently, safely, and effectively. Herbs also work on the cause of the problem rather than just the symptoms. 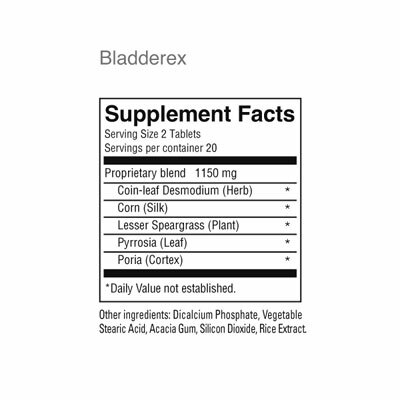 The following are brief descriptions of the ingredient herbs in BLADDEREX. In Traditional Chinese Medicine, coin-leaved desmodium is used for water retention, promoting urination, removing toxins, and relieving swelling. It is an excellent diuretic. It stimulates the secretion of bile and improves the function of the gall bladder and liver. This herb is a mild diuretic, which strengthens the general health of the urinary tract by increasing chloride excretion and dilating the capillaries. The Chinese and Native Americans alike have long used cornsilk as one of the best remedies for the kidney, bladder, and prostate. This herb increases the level of antibodies in the body by stimulating the liver function of producing natural antibodies. This herb increases white blood cell production, thus stimulating the immune system to kill a wide range of viruses. Chinese herbalists recommend this herb for kidney stones, nephritis and urinary tract infections. This herb is a diuretic and mild relaxant, commonly combined in formulas with cornsilk to treat urinary tract infections.